Hello, everyone... I am (or WE are) back. It has been a hectic time all around, hence the lack of blogging. I'm sure that was made obvious by my previous post. Additionally, with the holidays coming up and lots of stuff "hitting the fan" in other realms of life, I figure I better at least get this post up before too much time passes. For starters, the wedding went WAY better than I had anticipated. I will be doing a separate post on some of the details such as what came from where, etc., but let's just say I was a little nervous that I did a lot of things with little knowledge and little willingness for help. I was ambivalent about having a wedding in the first place, but I will say right away that I don't regret having one at all. While we would have been happy doing without one, I think all the work and money put into it was worth all the memories of the day. 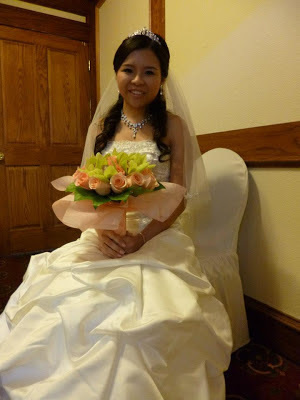 I didn't think I was going to partake in many Chinese customs for the wedding, particularly because it didn't seem "right" to do them if I wasn't going to marry a Chinese person or have a Chinese wedding, but thankfully, some got in there. A week before, per tradition, my mom gave me two bowls and two sets of chopsticks, some lotus seed, and red envelopes to take home. I turned it into a little shrine on one of our shelves, as there are few things more important to me than these types of ritual items. The night before, my dad suddenly asked me to come home, and after a nice dinner with family, he and my mom combed my hair (see little bow below) and burned ritual items on behalf of the occasion. Burning to the ancestors and deities. I added this little hair bow to my "shrine." Then, I was dropped off to my makeup appointment. I showed up late, because there was some sort of confusion with scheduling, but I had just enough time to put in three sets of extensions and massive amounts of makeup before heading to the place. I did a quick check of the room, (according to my friends) avoided being a "Bride-zilla," and went to change. My parents showed up about 30 minutes before the scheduled start. 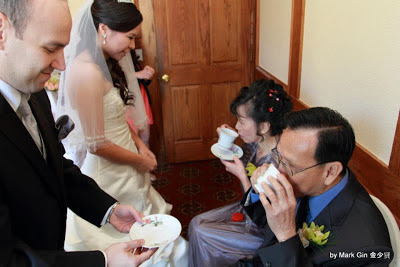 We did a small tea ceremony in the changing room... a tough feat in such a tiny space, but it meant a lot that we were able to still fit in this piece of my culture in spite of the mixing. "The Ukrainian" and I originally planned on not seeing each other before the ceremony, but exchanging one tradition for another, we did. After pouring tea for my parents, sister, and brother-in-law, I chilled in the room a bit with my best (female) friend and drank the chrysanthemum juice she brought me. 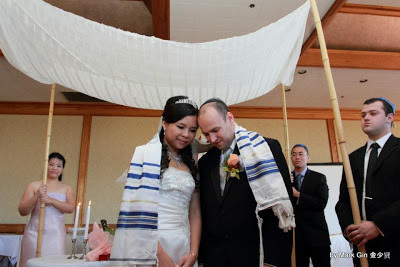 With things still passing by quickly, our officiant came into the room with "The Ukrainian" to place the "tallit" (shawl, see two pictures down) on him. As they left, my father covered me in my veil, and the music signalling the ceremony start soon followed. We had a Jewish-style ceremony because, well, "The Ukrainian" is of Jewish decent, and we knew that his side of the family would enjoy the tradition, and everyone else would get to see something "different." We both walked in with our parents and each had one sibling and mutual friends holding up our "chuppah" (canopy, more in the next post). I was really pleased with our officiant (a cantor from a local synagogue), who made the ceremony meaningful and not too intimidating for an "outsider" like me and those looking upon us. Plus, I loved his (Hebrew) singing. Traditionally, the bride and groom are supposed to be in seclusion for about 15 minutes after the ceremony ("yichud"), so we did that and once we came out, it was a flurry of dancing, photos, and more photos. I have never had so many cameras on me, nor did I get a chance to eat much like I had hoped. 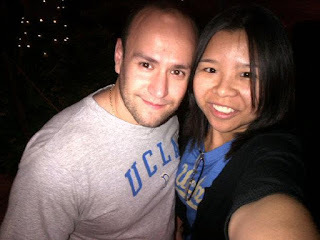 When I first saw the Immortals perform a couple of years ago, I kept in the back of my mind that we HAD to invite them to our wedding. Later, my dad told me that he had never seen lions dance at a wedding before, but those are actually a huge bulk of their gigs. 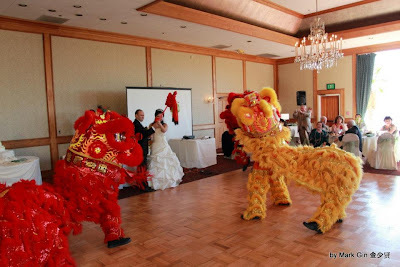 The lions symbolize luck and joy doing a traditional dance that kind of resembles fighting. We specifically kept pretty mum about them coming, as many of the guests had never seen a lion dance before, and it was great to see their surprise and the smiles of my parents as the all-too-familiar loud cymbal and gong-banging signaled their arrival. We were supposed to have ceiling decor (inevitable snag! ), but glad we went without because these guys got up HIGH. I'll talk more about our send-off once I get more pictures, but it involved glow-sticks and this song. We had about 70 in the room, and although that's small to most people's standards, it was still a lot of work. Our wedding day was one spent with close friends and family, which made it more personal as well as manageable. I can't thank our friends enough for their input and day-of assistance to ensure that things moved along. Even though we didn't plan it, we wound up with the top tier of our cake being brought to us. It is now double-wrapped and in a plastic container... though I don't know if I want to wait an entire YEAR to eat this cranberry Russian cake again. To close, as I'm drafting the next post... please let me know if you have any questions about anything related to the wedding! I'm by no means an expert now, but I can pretend to be one!! I loved reading about all of the cultural traditions you worked in. Congratulations to you both! What a beautiful ceremony. All the best, and I wish you both a lifetime of happiness! Beautiful ceremony Julie! Congrats to the two of you!